“Children can bring either a book or a magazine for the independent reading session,” read the note from school. “Aai, what is a magazine?” was the logical question that followed. My son is an avid reader but he has never read magazines. It has always been books – baby books, toddler books, pre-school books and now, as he likes to call them, chapter books. OKIDO – the arts and science magazine for kids, was his perfect introduction to children’s magazines. I like that OKIDO is based on the concept of learning through play. It is full of stories, activities and games that stimulate children to question and create. It is a fun way to inspire scientific curiosity in inquisitive young minds. The first OKIDO that we read was a holiday-themed issue. J loved that the first page prompted him to write down his name. Personalisation is a big thing even when you are 5. He then had a go reading a story where Messy Monster goes travelling and has an adventure. He enjoyed solving all the puzzles, from spot the differences to solving the maze. There were pieces where he needed a little help. So we both had a go matching holiday snaps in what looked like a bazaar in Morocco and tracing Aya’s route through London. This was especially fun as we had recently been around London ourselves, ending up in the dinosaur museum (AKA Natural History Museum) just like little Aya. My favourite piece was a board game in the magazine that prompted you to say hello, thank you and goodbye in different languages. The instructions were a bit tricky to follow, but it was a great exercise in early linguistics for my son. We have a few more issues of OKIDO to get through and I am seriously contemplating saving a couple for when we go travelling. It will be a marvellous way to keep J occupied on a long flight or car journey. 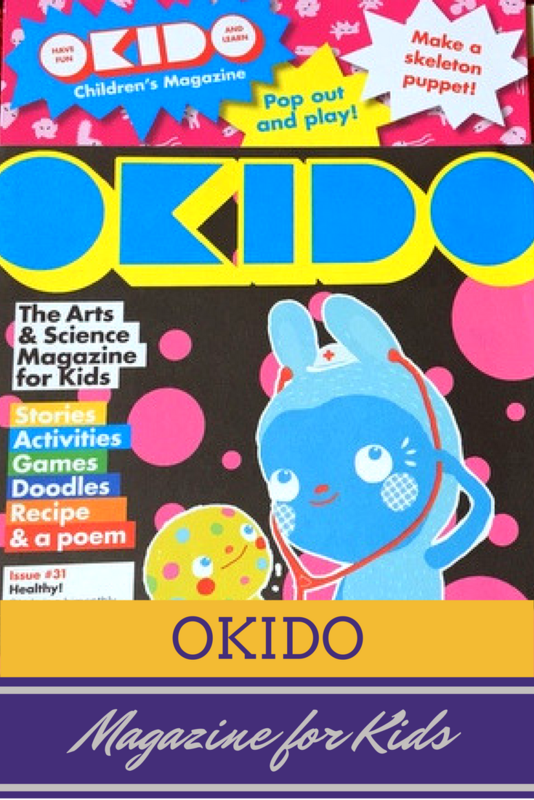 Individual OKIDO magazines are £4 each, and an annual subscription starts at £19.99. You get six magazines in a year, once every two months, which works out good value for money. Each magazine has around 50 pages of content designed to make learning fun. And every issue is based on a particular theme, so you get variety throughout the year. I think an annual subscription to OKIDO will make the perfect Christmas present for children. Why? For one, they get a gift that keeps giving all through the year. Secondly, it will get them reading. And learning new and interesting things. A win-win, don’t you think? The magazine is good, and I believe kids will love them. I think so too. And good value for money, if you think of an annual subscription.